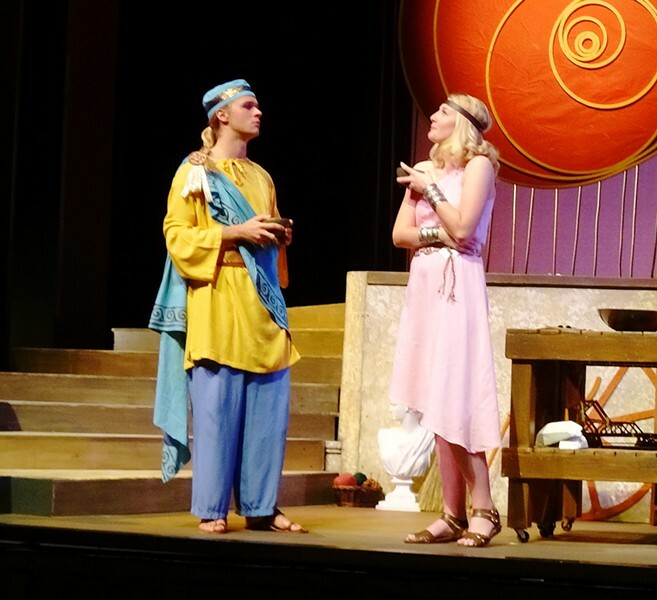 Trust Fall will show at Cal Poly's Spanos Theatre through Nov. 10. Tickets are $12 for students and children and $20 for adults. Visit pacslo.org for tickets and more information. Don't fly too close to the sun. It's good, solid advice that expands far beyond the moral of the cautionary tale it came from, of Icarus and his desire to fly higher and higher, giving in to his own hubris and paying the ultimate price. What if there were more to the story than that? In a whimsical rendition, Cal Poly professor Al Schnupp reimagines the classic myth in his original play, Trust Fall, which debuted at Cal Poly's Spanos Theatre Nov. 1. The tale is broken up into six scenes and features puppet interludes as well as the artistic use of overhead projectors to break up the dramatic tragedy that unfolds onstage. Trust Fall marks a retiring Schnupp's last production at Cal Poly. 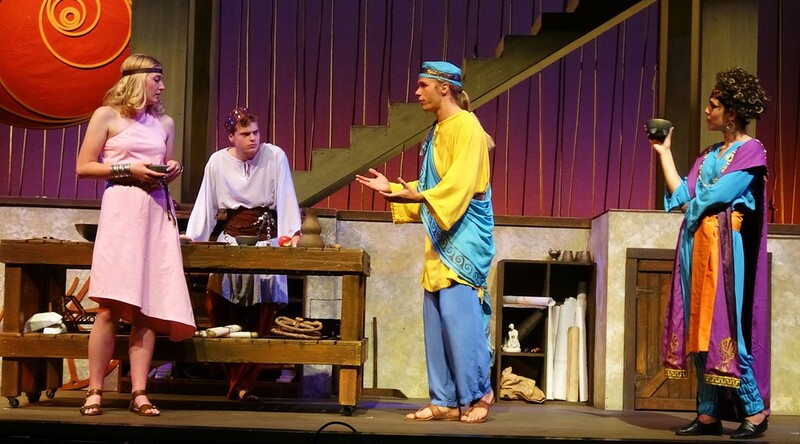 GREAT MINDS Lydia (Marie Althaus), Takus (William Murphy), Phidias (Caleb Winkleblech), and King Minos (Sabrina Harris) discuss the eccentricities of craftsman Daedalus and his chicken-obsessed son, Icarus, in the original play Trust Fall. Daedalus (Aiden Turner), the famous Athenian sculptor and inventor, lives a relatively quiet life with his simpleminded but observant son, Icarus (Romelo Urbi), who is obsessed with chickens. The monotony is broken up by Daedalus' saucy model, muse, and housekeeper, Lydia (Marie Althaus), and his art agent, the cunning Takus (William Murphy). A love hidden under witty remarks and minor arguments brews between Daedalus and Lydia, though both Turner and Althaus do an excellent job at portraying lovers in denial. The audience is also treated to a fantastical imagining of the adventures chickens have at night, according to Icarus. This is accomplished by actors moving images about on projectors, in an almost balletic sequence. Puppet interludes of various Greek stories also move the plot along, while providing context and comedic relief for the audience. And while chickens are Icarus' first love, he soon moves on to other birds and even yearns to go on adventures with Takus, saying, "I love chickens, but stories live longer," a nod to Icarus' own immortality in our cultural zeitgeist. THE COMPETITION Phidias (Caleb Winkleblech), the famous sculptor from Athens, attempts to lure away the model, Lydia (Marie Althaus), from his rival, Daedalus. But the story truly begins to come to a simmer when Daedalus receives an unusual visitor at his home, King Minos of Crete (Sabrina Harris). The flamboyant ruler comes with an odd request. As punishment for not sacrificing his prize bull, Zeus made Minos' wife fall madly in love with said animal. In an effort to be open-minded and ensure marital bliss, Minos wants Daedalus to sculpt a hollow calf for his wife to climb into so she can, ahem, mate with the bull. This results in the birth of a human-killing minotaur, which leads Minos to commission a labyrinth from Daedalus that no one can escape from—until someone does. Our tale comes to a full on boil when Minos aims his rage at Daedalus and Icarus. Arts Writer Ryah Cooley recognizes birds for the tiny dinosaurs that they are. Contact her at rcooley@newtimesslo.com.